Learn how to prepare and utilise the most important document for any organisation - the business plan. Whether one is just starting out or is already in business and needs to refocus, this practical guide will clearly instruct how to prepare a winning business plan. This book will become a valued resource for any entrepreneurs and business owners on their path towards future success. There are as many outlines for business plans as there are business plans. 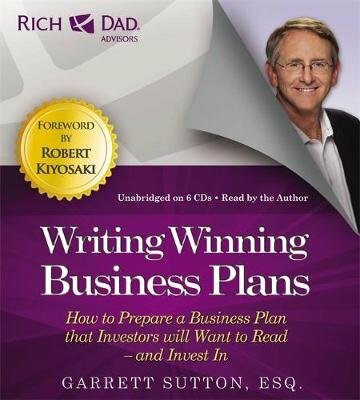 But in WRITING WINNING BUSINESS PLANS, Rich Dad's Advisors author Garrett Sutton explains how the basics of writing a great business plan tend to fall into four main parts: The Business - all pertinent aspects of the business on every aspect of production from initial idea to service after the sale; The Marketing - thorough discussion of the industry and your business's place in it; The Financials - short- and long-term costs and revenues presented in ways that will help financial experts to determine the risk of your business idea; The Supporting Material - how to back up your proposal with the contents of the rest of your plan, which depends on the type of business you are planning.